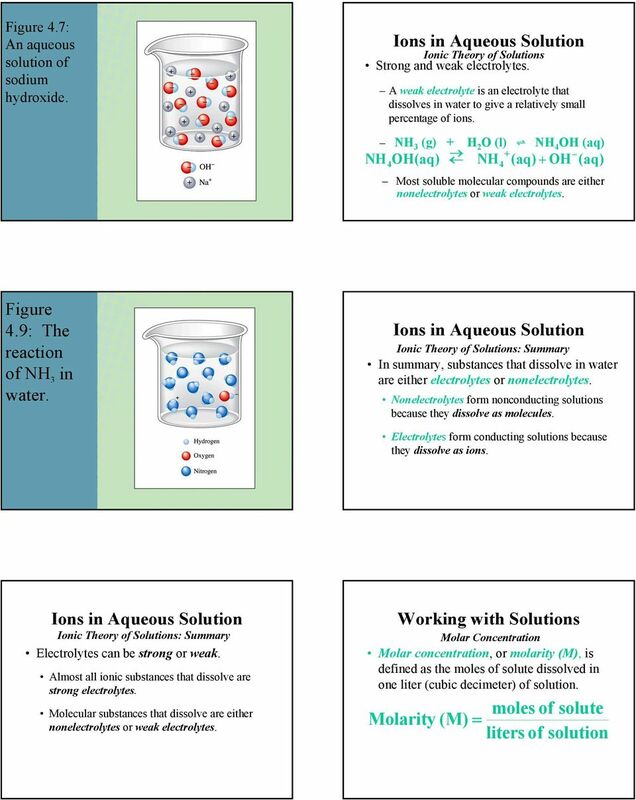 Download "Aqueous Solutions. Water is the dissolving medium, or solvent. Some Properties of Water. A Solute. 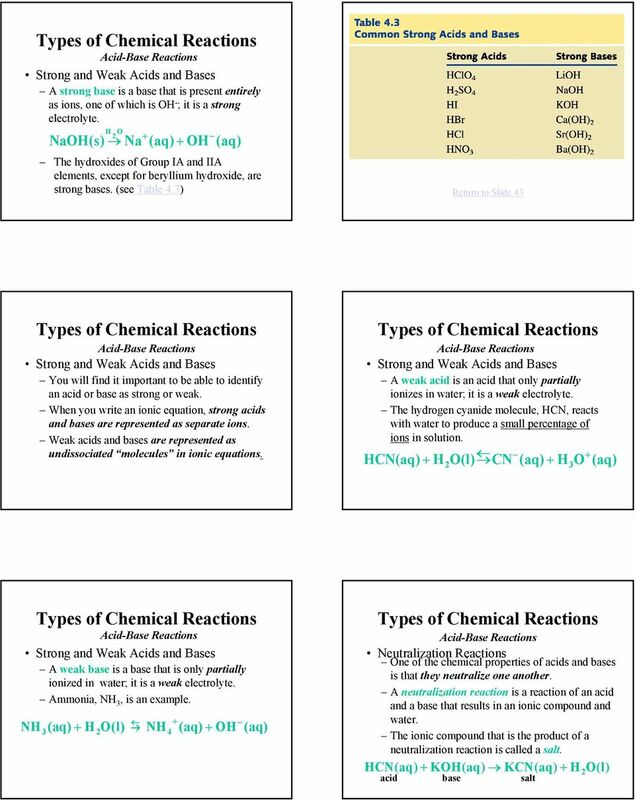 Types of Chemical Reactions." 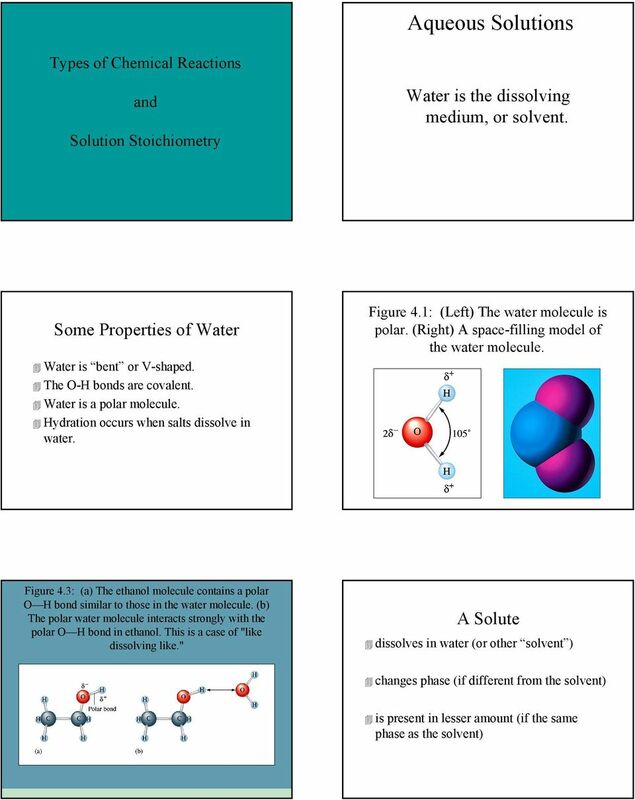 2 A Solvent retains its phase (if different from the solute) is present in greater amount (if the same phase as the solute) Ionic Theory of Solutions Some molecular compounds dissolve but do not dissociate into ions. H O C6H12O6(s) (glucose) C6H12O6 2 These compounds are referred to as nonelectrolytes. They dissolve in water to give a nonconducting solution. 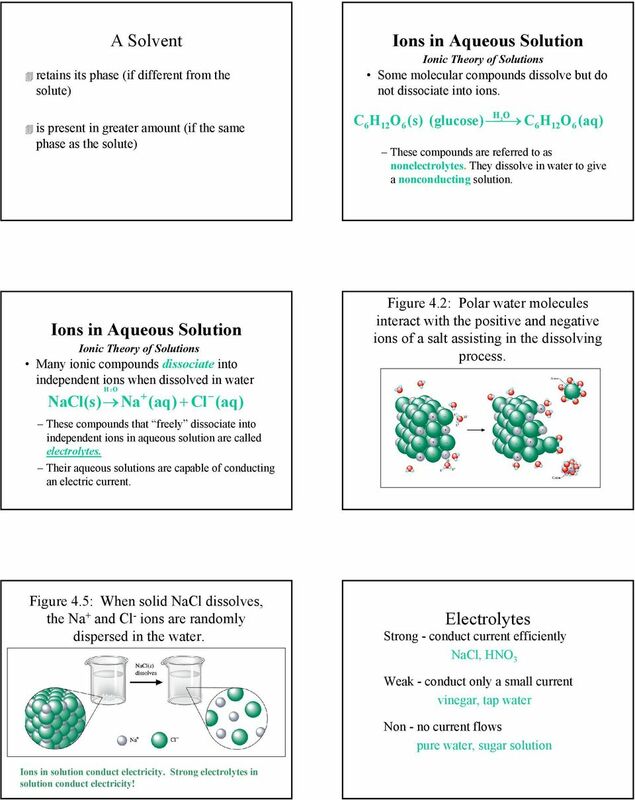 Ionic Theory of Solutions Many ionic compounds dissociate into independent ions when dissolved in water H 2O NaCl(s) Na Cl These compounds that freely dissociate into independent ions in aqueous solution are called electrolytes. Their aqueous solutions are capable of conducting an electric current. Figure 4.2: Polar water molecules interact with the positive and negative ions of a salt assisting in the dissolving process. Figure 4.5: When solid NaCl dissolves, the Na and Cl - ions are randomly dispersed in the water. Electrolytes Strong - conduct current efficiently NaCl, HNO Weak - conduct only a small current vinegar, tap water Non - no current flows pure water, sugar solution Ions in solution conduct electricity. Strong electrolytes in solution conduct electricity! 6 Working with Solutions Molar Concentration Let s try an example. A sample of mol iron(iii) chloride, FeCl, was dissolved in water to give 25.0 ml of solution. What is the molarity of the solution? moles of FeCl Since molarity = liters of solution mole of FeCl then M = = 1.6 M FeCl liter of solution Working with Solutions How many moles of Cl - are in 1.00 L of 1.6 M FeCl solution? 1.6 moles FeCl x moles Cl - x 1.00 L soln = 4.08 moles Cl L soln. 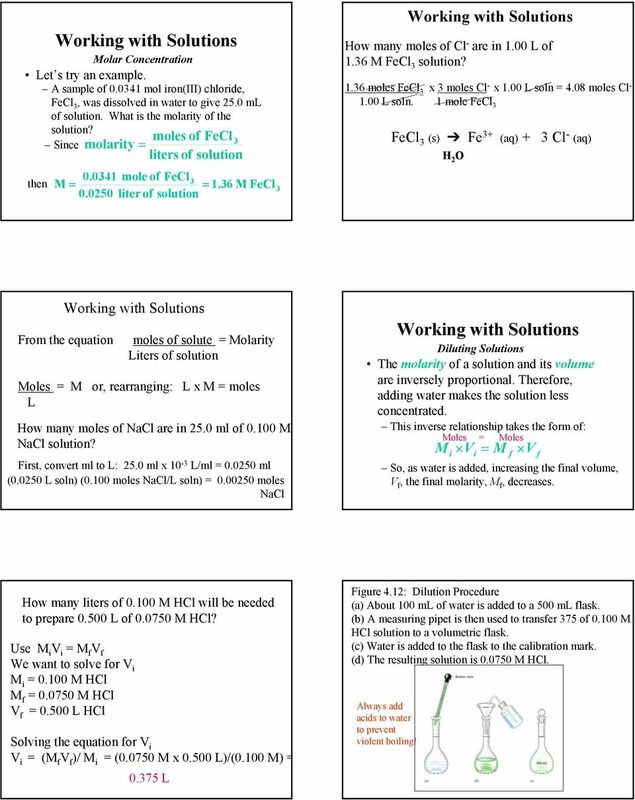 1 mole FeCl FeCl (s) ö Fe Cl - H 2 O Working with Solutions From the equation moles of solute = Molarity Liters of solution Moles = M or, rearranging: L x M = moles L How many moles of NaCl are in 25.0 ml of M NaCl solution? 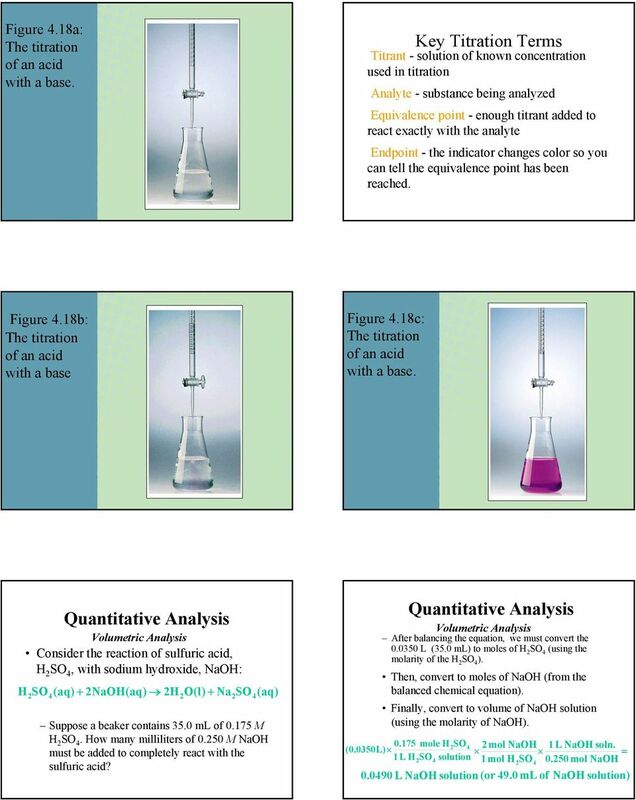 First, convert ml to L: 25.0 ml x 10 - L/ml = ml ( L soln) (0.100 moles NaCl/L soln) = moles NaCl Working with Solutions Diluting Solutions The molarity of a solution and its volume are inversely proportional. Therefore, adding water makes the solution less concentrated. This inverse relationship takes the form of: Moles = Moles M V = M V i i So, as water is added, increasing the final volume, V f, the final molarity, M f, decreases. f f How many liters of M HCl will be needed to prepare L of M HCl? Use M i V i = M f V f We want to solve for V i M i = M HCl M f = M HCl V f = L HCl Solving the equation for V i V i = (M f V f )/ M i = ( M x L)/(0.100 M) = 0.75 L Figure 4.12: Dilution Procedure (a) About 100 ml of water is added to a 500 ml flask. 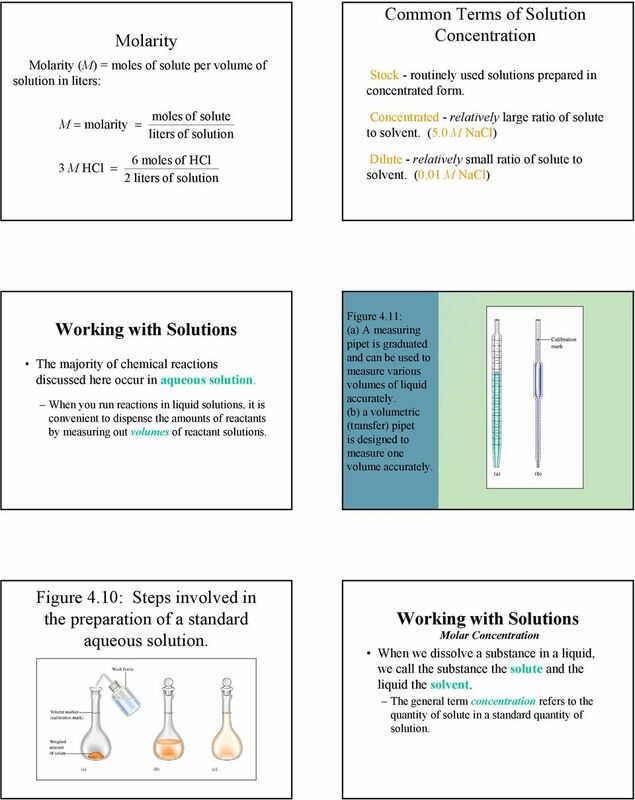 (b) A measuring pipet is then used to transfer 75 of M HCl solution to a volumetric flask. (c) Water is added to the flask to the calibration mark. (d) The resulting solution is M HCl. Always add acids to water to prevent violent boiling! 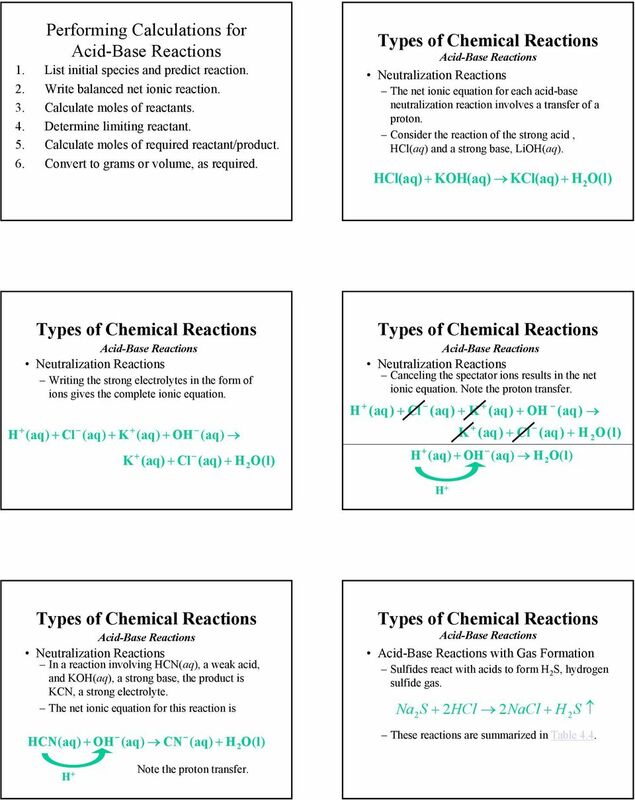 9 Describing Reactions in Solution (continued). 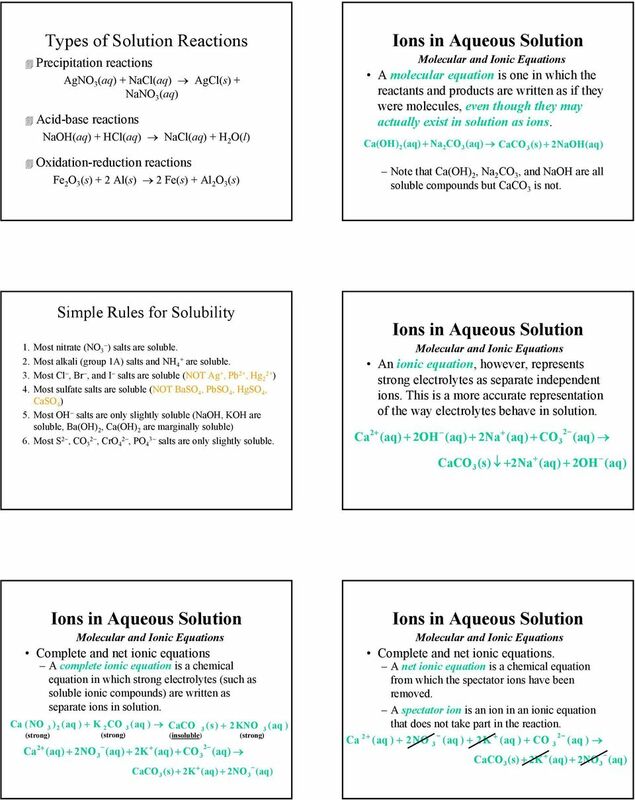 Net ionic equation (show only components that actually react) Ag Cl AgCl(s) K and NO are spectator ions. The Arrhenius Concept The Arrhenius concept defines acids as substances that produce hydrogen ions, H, when dissolved in water. An example is nitric acid, HNO, a molecular substance that dissolves in water to give H and NO -. 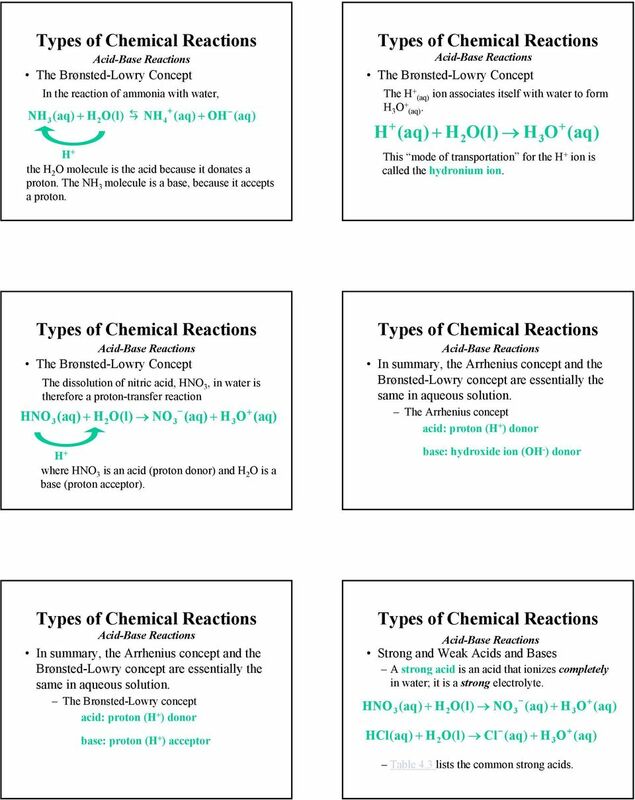 H2O HNO H NO The Arrhenius Concept The Arrhenius concept defines bases as substances that produce hydroxide ions, OH -, when dissolved in water. An example is sodium hydroxide, NaOH, an ionic substance that dissolves in water to give sodium ions and hydroxide ions. H 2 O NaOH(s) Na OH The Arrhenius Concept The molecular substance ammonia, NH, is a base in the Arrhenius view, NH H2O(l) NH4 OH because it yields hydroxide ions when it reacts with water. The Brønsted-Lowry Concept The Brønsted-Lowry concept of acids and bases involves the transfer of a proton (H ) from the acid to the base. In this view, acid-base reactions are protontransfer reactions. The Brønsted-Lowry Concept The Brønsted-Lowry concept defines an acid as the species (molecule or ion) that donates a proton (H ) to another species in a protontransfer reaction. Abase is defined as the species (molecule or ion) that accepts the proton (H ) in a protontransfer reaction. 10 The Brønsted-Lowry Concept In the reaction of ammonia with water, NH H2O(l) NH4 OH H the H 2 O molecule is the acid because it donates a proton. The NH molecule is a base, because it accepts a proton. The Brønsted-Lowry Concept The H ion associates itself with water to form H O. H H2O(l) HO This mode of transportation for the H ion is called the hydronium ion. The Brønsted-Lowry Concept The dissolution of nitric acid, HNO, in water is therefore a proton-transfer reaction HNO H2O(l) NO HO H where HNO is an acid (proton donor) and H 2 O is a base (proton acceptor). In summary, the Arrhenius concept and the Brønsted-Lowry concept are essentially the same in aqueous solution. The Arrhenius concept acid: proton (H ) donor base: hydroxide ion (OH - ) donor In summary, the Arrhenius concept and the Brønsted-Lowry concept are essentially the same in aqueous solution. The Brønsted-Lowry concept acid: proton (H ) donor base: proton (H ) acceptor Strong and Weak Acids and Bases A strong acid is an acid that ionizes completely in water; it is a strong electrolyte. 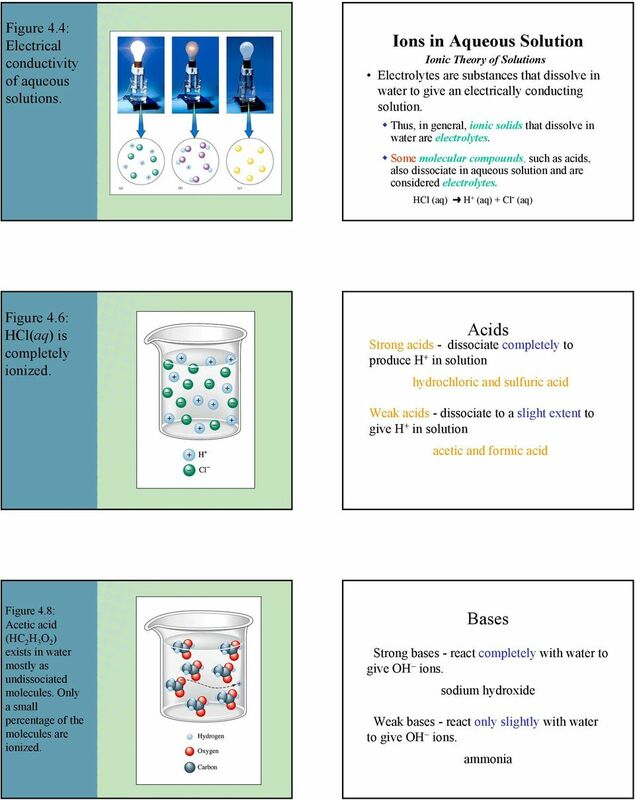 HNO H2O(l) NO HO HCl H2O(l) Cl HO Table 4. lists the common strong acids. 13 Performing Calculations for 1. 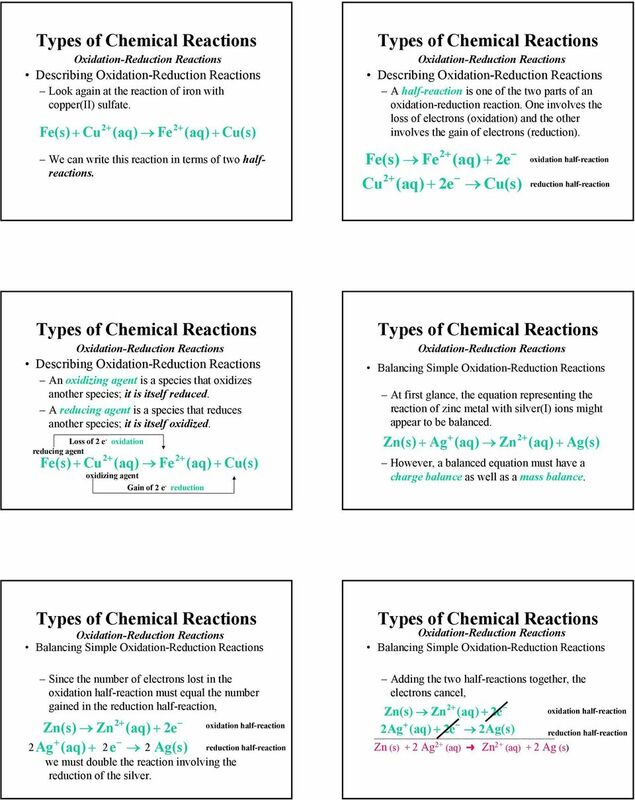 List initial species and predict reaction. 2. Write balanced net ionic reaction.. Calculate moles of reactants. 4. Determine limiting reactant. 5. Calculate moles of required reactant/product. 6. Convert to grams or volume, as required. Neutralization Reactions The net ionic equation for each acid-base neutralization reaction involves a transfer of a proton. Consider the reaction of the strong acid, HCl and a strong base, LiOH. 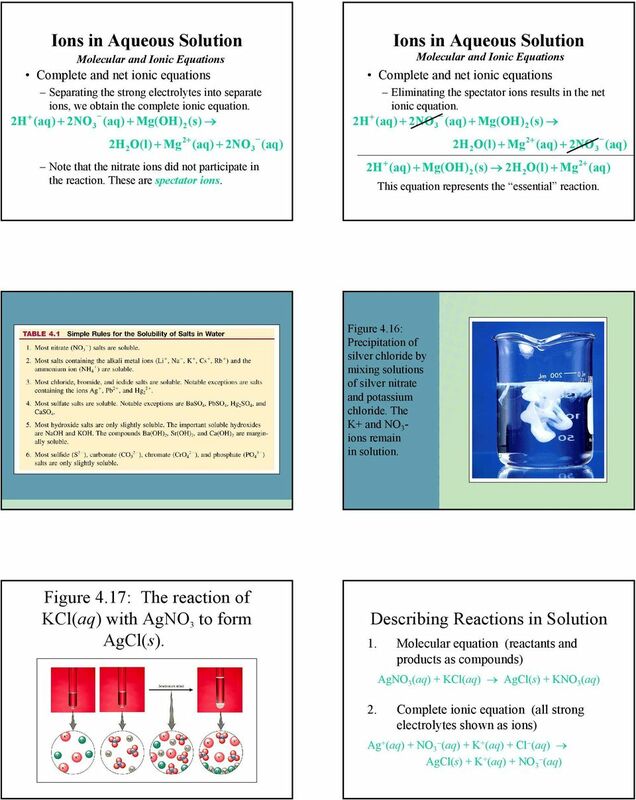 HCl KOH KCl H2O(l) Neutralization Reactions Writing the strong electrolytes in the form of ions gives the complete ionic equation. H Cl K OH K 2 Cl H O(l) H Neutralization Reactions Canceling the spectator ions results in the net ionic equation. Note the proton transfer. (aq ) Cl (aq ) K (aq ) OH (aq ) K (aq ) Cl (aq ) H 2O(l) H 2 OH H O(l) H Neutralization Reactions In a reaction involving HCN, a weak acid, and KOH, a strong base, the product is KCN, a strong electrolyte. The net ionic equation for this reaction is HCN OH CN H2O(l) with Gas Formation Sulfides react with acids to form H 2 S, hydrogen sulfide gas. Na2S 2HCl 2NaCl H 2S These reactions are summarized in Table 4.4. H Note the proton transfer. 15 Figure 4.10: Reaction of iron with Cu 2. Photo courtesy of American Color. The reaction of an iron nail with a solution of copper(ii) sulfate, CuSO 4, is an oxidationreduction reaction (see Figure 4.10). The molecular equation for this reaction is: Fe(s) CuSO FeSO4 4 Cu(s) Return to Slide 54 The net ionic equation shows the reaction of iron metal with Cu 2 to produce iron(ii) ion and copper metal. Loss of 2 e -1 oxidation Fe(s) Cu 2 Fe 2 Gain of 2 e -1 reduction Cu(s) Oxidation Numbers The concept of oxidation numbers is a simple way of keeping track of electrons in a reaction. The oxidation number (or oxidation state) of an atom in a substance is the actual charge of the atom if it exists as a monatomic ion. Alternatively, it is hypothetical charge assigned to the atom in the substance by simple rules. Oxidation Number Rules Rule Applies to Statement 1 2 Elements Monatomic ions Oxygen The oxidation number of an atom in an element is zero. This includes molecular elements. The oxidation number of an atom in a monatomic ion equals the charge of the ion. The oxidation number of oxygen is 2 in most of its compounds. (An exception is O in H 2 O 2 and other peroxides, where the oxidation number is 1.) 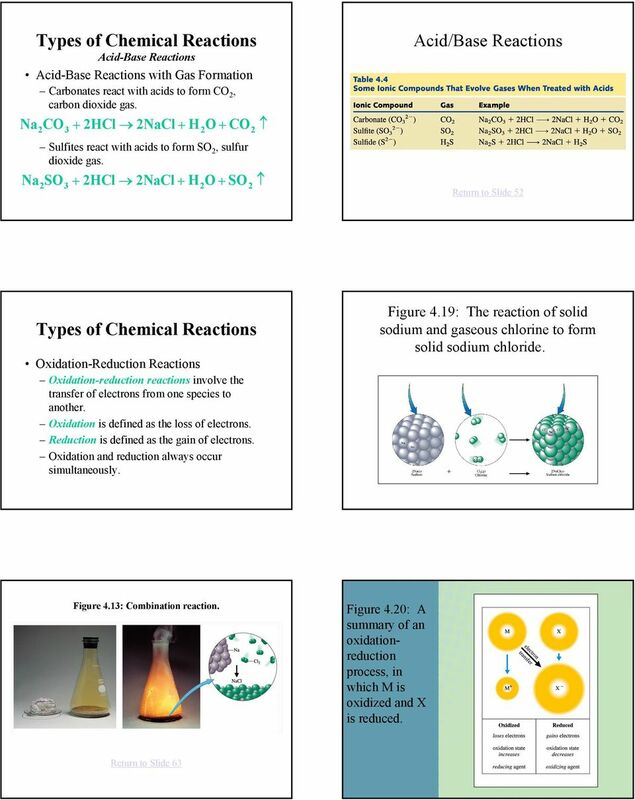 Oxidation Number Rules Rule Applies to Statement Hydrogen Halogens Compounds and ions The oxidation number of hydrogen is 1 in its covalent compounds. Fluorine is 1 in all its compounds. The other halogens are 1 unless the other element is another halogen or oxygen. The sum of the oxidation numbers of the atoms in a compound is zero. The sum in a polyatomic ion equals the charge on the ion. 17 Rules for Assigning Oxidation States Figure 4.12: The burning of calcium metal in chlorine. Photo courtesy of James Scherer. Ca (s) Cl 2 (g) º CaCl 2 (s) Ca º Ca 2 2 e - Cl 2 2 e - º 2 Cl - Ca (s) Cl 2 (g) º CaCl 2 (s) 1. Oxidation state of an atom in an element = 0 2. Oxidation state of monatomic element = charge. Oxygen = 2 in covalent compounds (except in peroxides where it = 1) 4. H = 1 in covalent compounds 5. Fluorine = 1 in compounds 6. Sum of oxidation states = 0 in compounds Sum of oxidation states = charge of the ion Return to Slide 62 Balancing by Half-Reaction Method 1. Write separate reduction, oxidation reactions. 2. For each half-reaction: Balance elements (except H, O) Balance O using H 2 O Balance H using H Balance charge using electrons Half-Reaction Method - Balancing in Base 1. Balance as in acid. 2. Add OH that equals H ions (both sides!). Form water by combining H, OH. 4. Check elements and charges for balance. 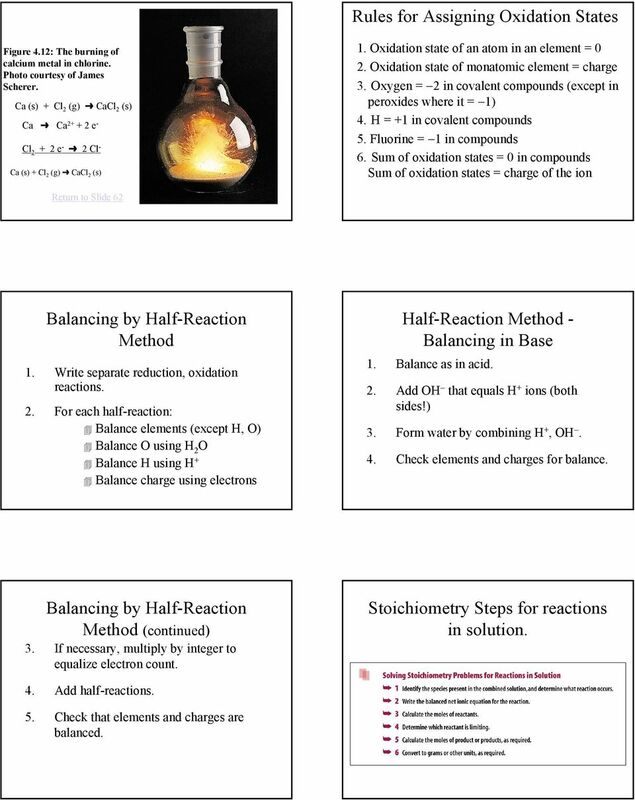 Balancing by Half-Reaction Method (continued). If necessary, multiply by integer to equalize electron count. 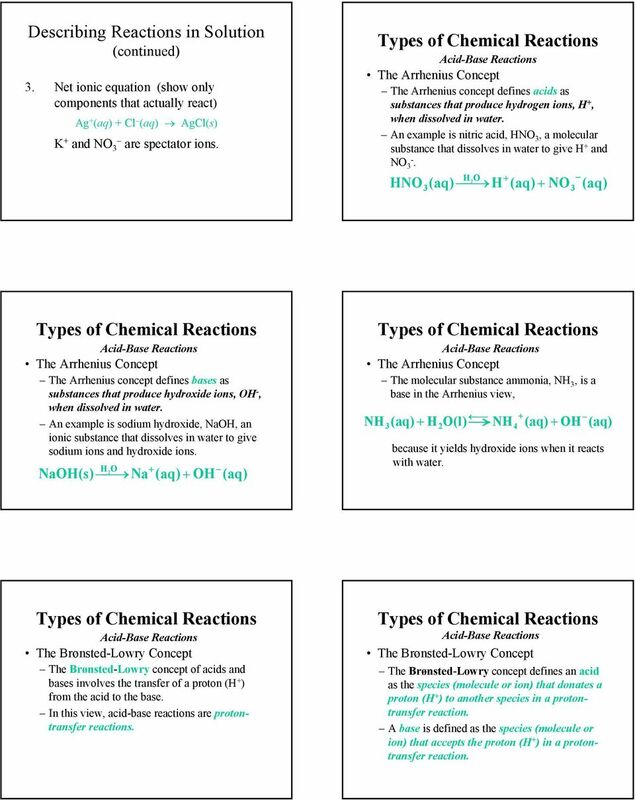 Stoichiometry Steps for reactions in solution. 4. Add half-reactions. 5. Check that elements and charges are balanced. 1/7/2013. Chapter 9. Chemical Reactions in Aqueous Solutions. Chemistry: Atoms First Julia Burdge & Jason Overby. Reactions in Aqueous Solutions 9. TOPIC 6. 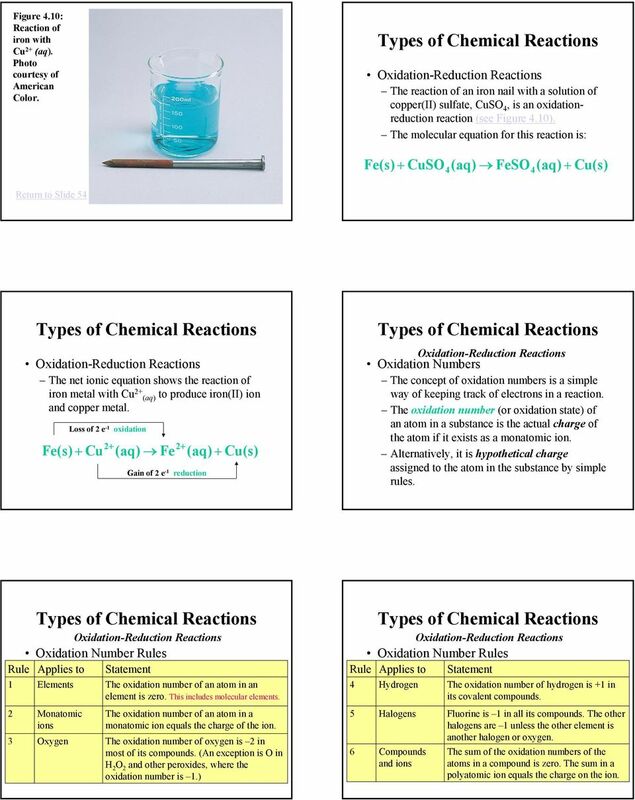 CHEMICAL REACTIONS AND IONIC EQUATIONS.